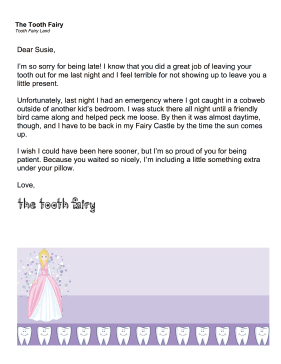 If the Tooth Fairy "forgot" to show up one night, use this printable letter that provides an excuse for the lateness. I'm so sorry for being late! I know that you did a great job of leaving your tooth out for me last night and I feel terrible for not showing up to leave you a little present. Unfortunately, last night I had an emergency where I got caught in a cobweb outside of another kid's bedroom. I was stuck there all night until a friendly bird came along and helped peck me loose. By then it was almost daytime, though, and I have to be back in my Fairy Castle by the time the sun comes up. I wish I could have been here sooner, but I'm so proud of you for being patient. Because you waited so nicely, I'm including a little something extra under your pillow.